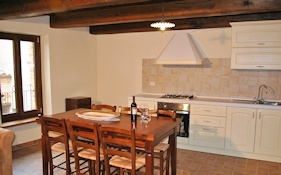 La ‘Sera del dì di festa’ is an apartment in a house located right in the centre, and at the highest point of the village. This is an ancient building constructed of brick and stone and has striking alcoves and a ceiling of wood and tiles, very much as it was in its original state. Looking out from the windows of this apartment you can see inside some of the remaining ruins from which it is possible to imagine the historic rural life of this village. 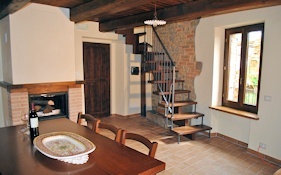 The apartment is entered via an external stone staircase which is typical of Le Marche farmhouses. 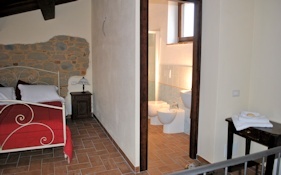 On the first floor, after crossing a hallway there is a large room with a well equipped kitchen, fireplace, dining table and chairs and a comfortable sofa on which to relax (this is a double sofa bed which can sleep 2). A wood and metal staircase leads to the upper floor where there is a spacious double bedroom which sleeps 4 and a bathroom with a toughened safety glass shower enclosure. 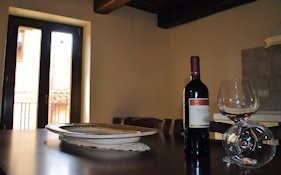 This apartment links to the apartment ‘A Silvia’ on the ground floor via a private entrance. ‘A Silvia’ is dug entirely into the rock and has a double bedroom and bathroom with a toughened safety glass shower enclosure.